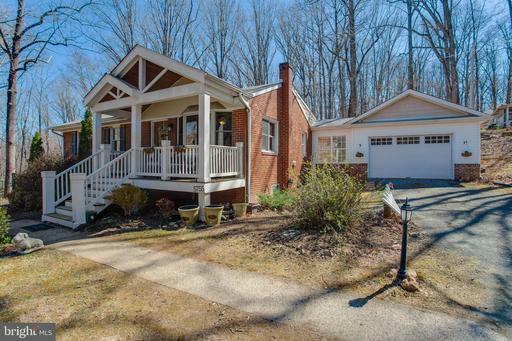 OPEN HOUSE SCHEDULED FOR 4/7/19 CANCELED, HOME UNDER CONTRACT! Modern Farmhouse-Style Living! This lovely red brick home with main-level living is a 1-acre peaceful retreat on the DC side of Warrenton! Set back from the road with an expansive fenced-in yard, this almost 2,000 square foot home has the cutest front porch. Enter into the main living area with huge bay window and modern farmhouse d~cor~hardwood floors, beautiful wood doors, trim and molding, hickory cabinets. The kitchen boasts tile backsplash and granite countertops, and the light-filled sunroom has heated ceramic floors and an exposed brick wall. Two spacious bedrooms and a wonderfully updated bathroom with jetted tub complete the main level. The lower level multi-purpose living area has a walk-up to the side yard and includes an optional 3rd bedroom space with ceramic tile, closet and updated full bathroom~a perfect guest suite! There is plenty of additional space to use as an office, playroom, or fitness room and sliding partitions to segment the area. The attached 1.5-car garage provides plenty of space. And, the basement laundry area and utility room offer additional storage.